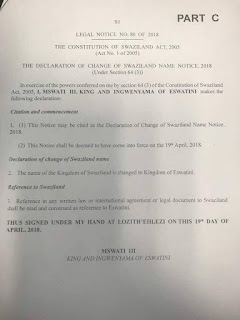 King Mswati III, the absolute monarch in Swaziland, has signed what amounts to a decree to formalise his unilateral decision to change the kingdom’s name to Eswatini. It demonstrates how much the kingdom is under his control and signals a reminder that elections due to be held later this year have no validity. A Legal Notice No 80 of 2018 was released on Thursday (17 May 2018) confirming the name-change came into force on 19 April 2017. It was then at an event to jointly mark his 50th birthday and the 50th anniversary of Swaziland’s independence from Great Britain, King Mswati announced his proclamation. 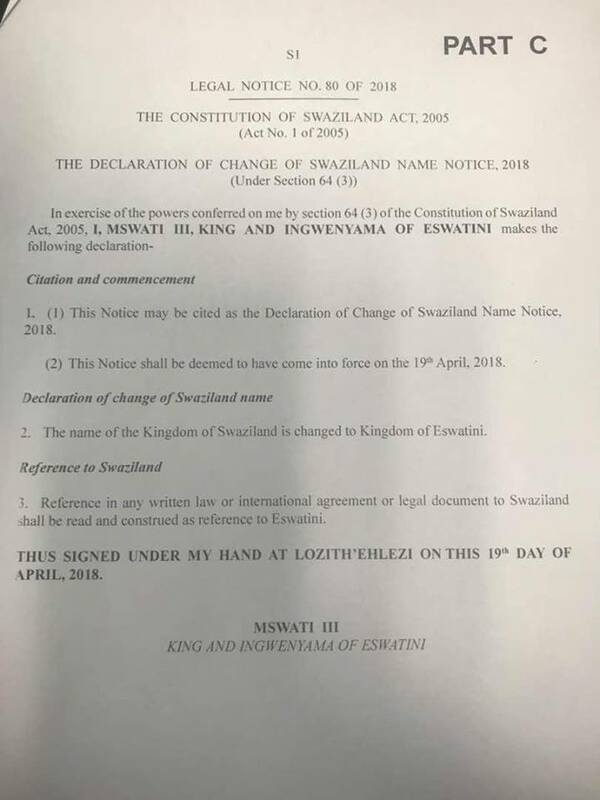 The Legal Notice states that, ‘reference in any written law or international agreement or legal document to Swaziland shall be read and construed as reference to Eswatini’. The King’s announcement in April was received with mixed emotions. The heavily-censored news media in Swaziland welcomed the move joyously. Meanwhile, critics argued that the King should not make the change without first consulting the people and parliament. The King’s decree is a reminder that Swaziland is not a democracy. On Sunday (13 May 2018) voter registration began ahead of national elections later this year. Political parties are banned from taking part and the King picks the Prime Minister and Government. At past elections people only got to select 55 of 65 members of the House of Assembly. The King chose the other 10. At this election there will be an additional four seats for people to vote for. It has not been announced how many members the King will choose but the Swaziland Constitution allows him to pick up to ten. As in previous years, none of the 30 members of the Swazi Senate will be elected by the people; the King will choose 20 and the other 10 will be chosen by members of the House of Assembly. The European Union Election Experts Mission (EEM), one of a number of international groups that monitored the conduct of Swaziland’s previous election in 2013, made much of how the kingdom’s absolute monarchy undermined democracy. In its report it stated, ‘The King has absolute power and is considered to be above the law, including the Constitution, enjoying the power to assent laws and immunity from criminal proceedings. A bill shall not become law unless the King has assented to it, meaning that the parliament is unable to pass any law which the King is in disagreement with. The EEM went on to say the ‘main principles for a democratic state are not in place’ in Swaziland. It stated, ‘Elections are a mechanism for the popular control of government and ensure the government accountability to the people. The King appoints the Cabinet. A vote of no confidence in the prime minister and government from more than two-thirds of the members of the House, in October , was easily reversed although the Constitution provides that in such cases the prime minister shall be removed from office. The EEM was not alone in recognising Swaziland as undemocratic. In its report on conduct of the 2013 election, the African Union (AU) mission called for fundamental changes to ensure people had freedom of speech and of assembly. The AU said the Swaziland Constitution guaranteed ‘fundamental rights and freedoms including the rights to freedom of association’, but in practice ‘rights with regard to political assembly and association are not fully enjoyed’. The AU said this was because political parties were not allowed to contest elections. The AU urged Swaziland to review the constitution, especially in the areas of ‘freedoms of conscience, expression, peaceful assembly, association and movement as well as international principles for free and fair elections and participation in electoral process’. In its report on the 2013 elections, Commonwealth observers recommended that measures be put in place to ensure separation of powers between the government, parliament and the courts so that Swaziland was in line with its international commitments. They also called on the Swaziland Constitution to be ‘revisited’. It also recommended that a law be passed to allow for political parties to take part in elections, ‘so as to give full effect to the letter and spirit of Section 25 of the Constitution, and in accordance with Swaziland’s commitment to its regional and international commitments’. In 2015, following a visit to Swaziland, a Commonwealth mission renewed its call for the constitution to be reviewed so the kingdom could move toward democracy. The constitutional review has not taken place.